Los Altos is centrally located on the San Francisco Pennisula just a short 20 minutes from either San Francisco International airport or San Jose International airport. Below is a simplified map of the area. For specific driving directions click here for Mapquest map & directions. 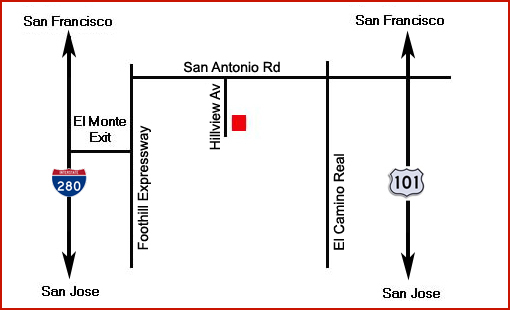 The Hillview Community Center is located in the same complex as the Los Altos Library, Los Altos Police Department and the Los Altos History Museum. There is plenty of free parking in any of the town lots or on the streets of Los Altos.